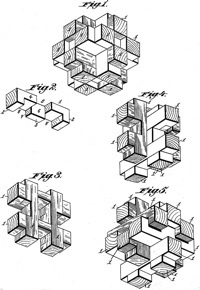 The most well known burr is the standard 6 piece burr, with 2 x 2 x 6 unit pieces (or sometimes 2 x 2 x 8). 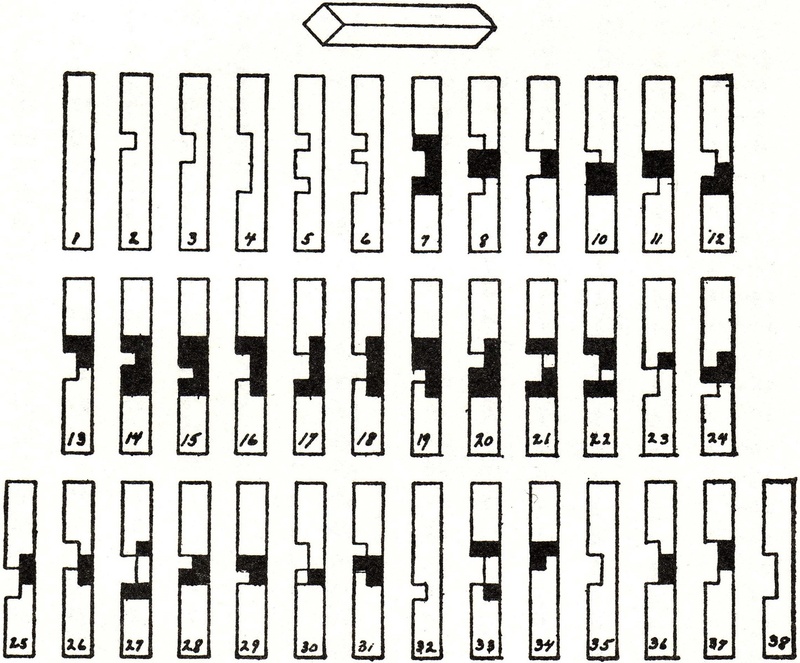 For example, the figure above shows Coffin's Improved Burr, which requires 3 moves to remove the first piece (letters show how pieces fit, numbers indicate an order in which they can be disassembled). 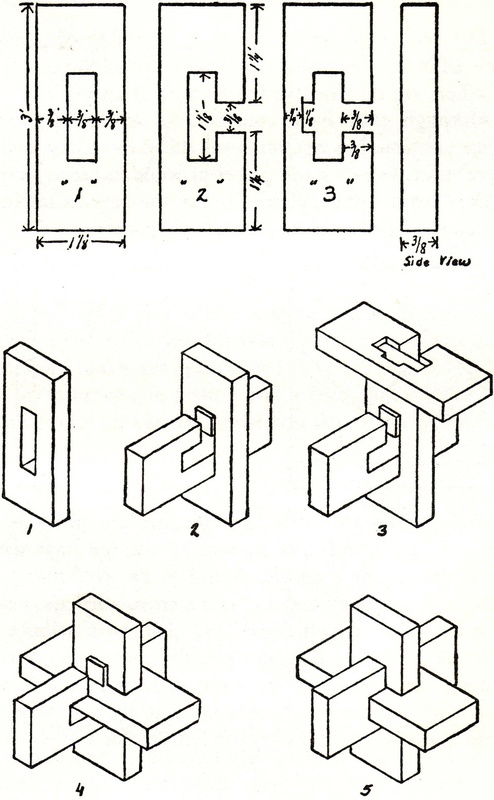 Volume of six solid pieces = 6 x 24 = 144 (or 192 for 2x2x8 pieces). Volume of a solid burr = 24+24+16+16+12+12 = 104 (or 152 for 2x2x8 pieces). 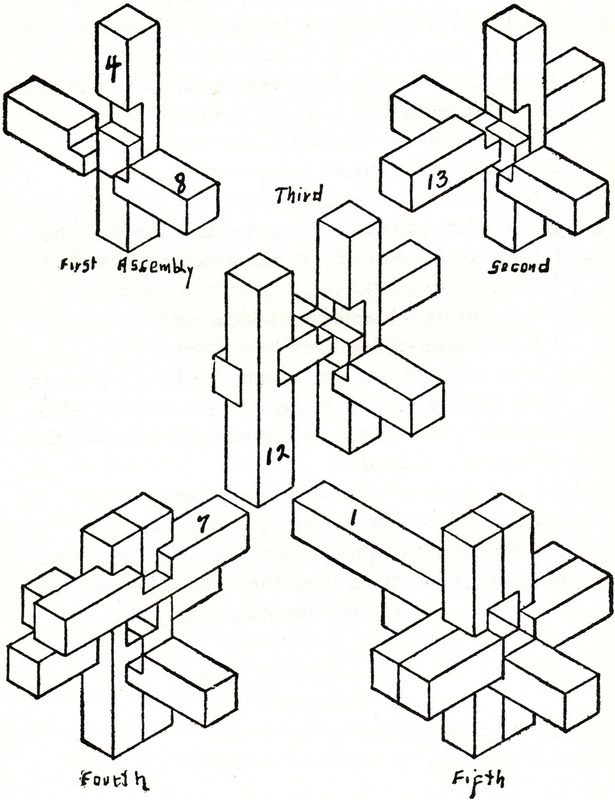 Holes = (total number of unit cubes removed from the six pieces) - 40. 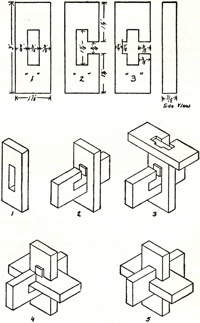 Highest level for unique solution with 3 holes = 7. Highest level for unique solution with 4 holes = 8. Highest level for unique solution with 5 holes = 9. Highest level with a unique solution (uses 7 holes) = 10. There are no standard 6-piece burrs of level 11. Highest possible level (its the only one, but has non-unique solution) = 12. 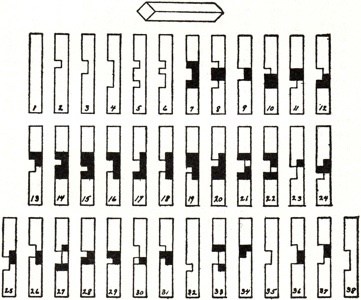 Highest level for unique notchable (has 7 holes) = 5. Highest level for notchable with non-unique solution = 10. Highest level when fractional moves may be made. Highest level when rotations may be made. Solutions that have exposed holes. 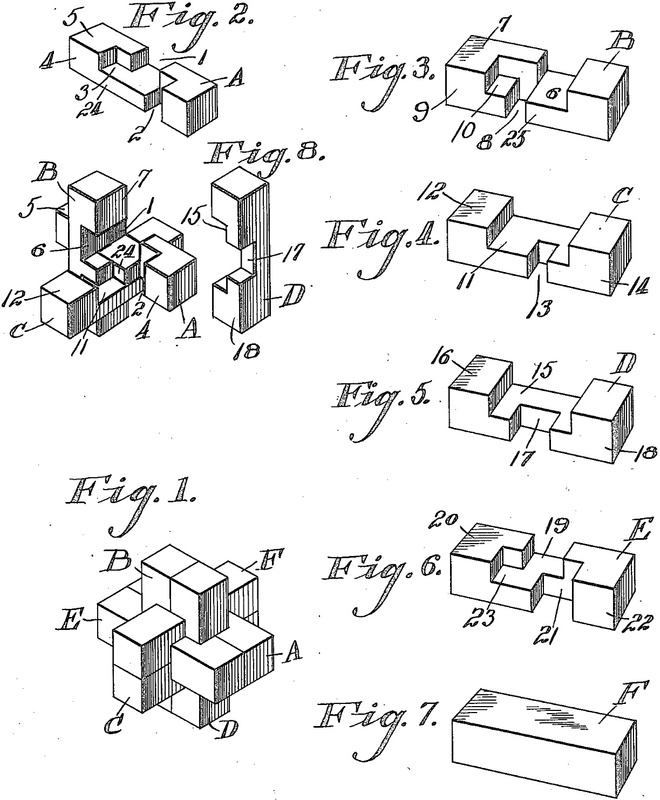 Solutions where the additional moves to remove the second piece require more moves than the first. Non-standard 6-piece burrs have six pieces but don't adhere to standard construction rules. Burrs in the theme of the standard 6-piece burrs but with more pieces can be very hard, and more pieces combined with non-standard types of constructions can derail approaches that you have worked out for standard constructions. Finally, burrs with fewer than six pieces can be quite fun. The most well known are 3 piece "knots" that fit together in a simple but not at first apparent way. 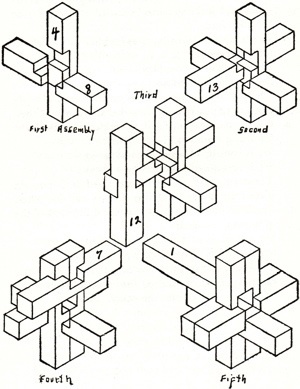 Some three piece knot variations require unusual twists or diagonal motions as well. Burrs in the theme of the standard 6-piece burrs with as few as 3 pieces can be quite difficult (e.g., the Cuter Level 8 GigaBurr). The basic idea of a burr seems quite old. 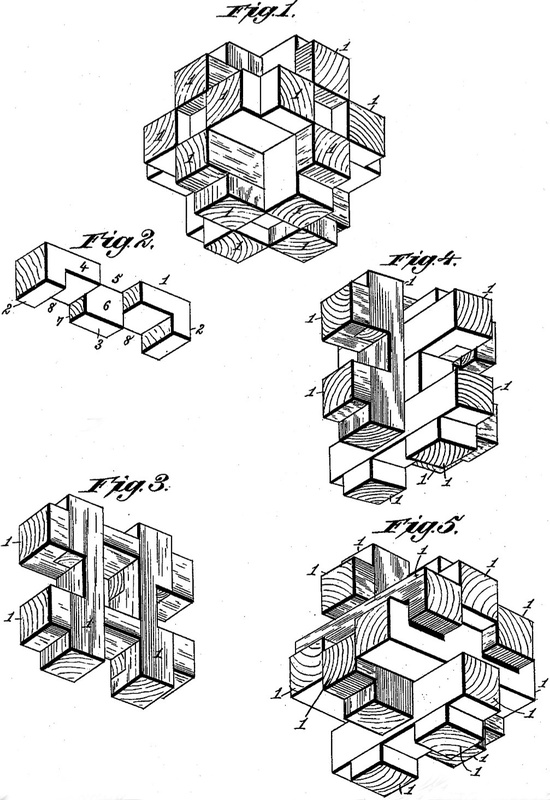 The 1893 Hoffman book presents a wood knot as "Cross Keys" and a 6-piece burr as "The Nut". 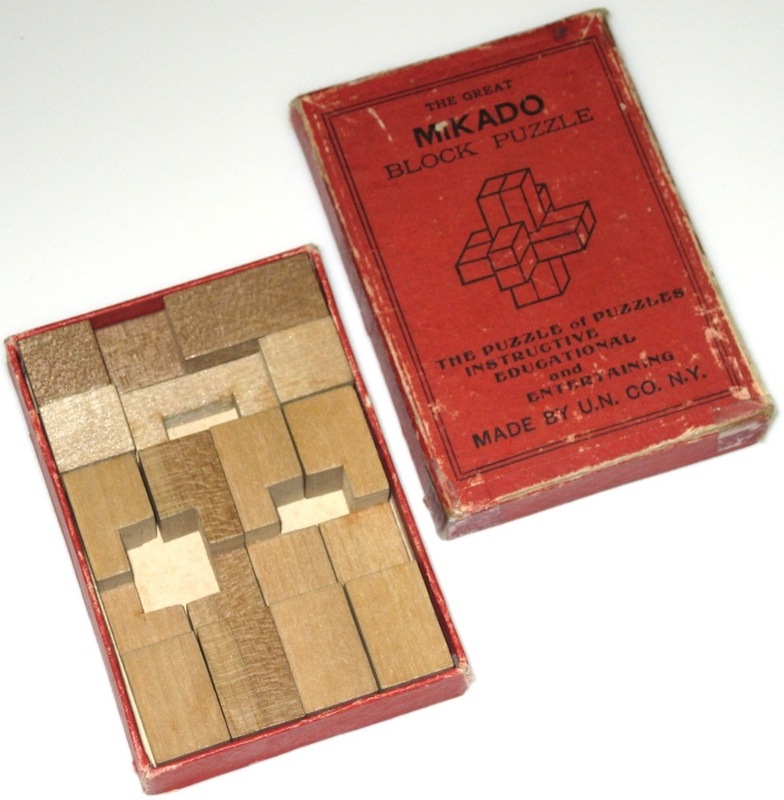 The 1929 Johnson and Smith Catalog, on pages 254-255, shows a 6-piece burr, a two burr stick, and related wood puzzles. The Puzzlers' Tribute book, on page 260 cites a 6-piece burr called the Devil's Hoof and a 24-piece burr called the Large Devil's Hoof in a Catel's catalogue of 1785, and credits David Singmaster as having found an example of a 6-piece burr in a 1733 Spanish book by Pablo Minguet E. Irol; also, on page 262 it credits the Mikado Puzzle as shown in the 1915 C. J. Felsman Catalogue. 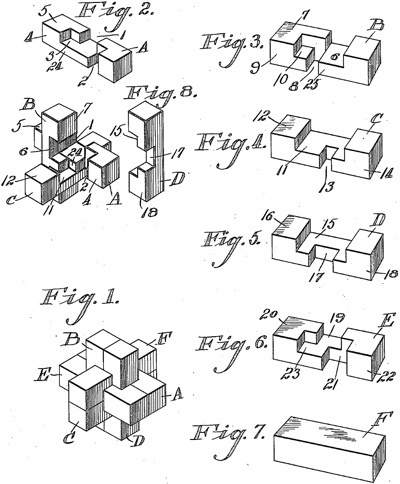 The Slocum and Botermans New Book of Puzzles on page 52 discusses the Spears Puzzle knots manufactured in Bavaria in 1910 and marketed in England; it is also mentioned that six piece burrs appeared in Bestelmeier's 1803 Toy Catalog.